To evaluate the storage resource of offshore State lands by refining capacity estimates. To verify the ability of the Miocene-age rocks of the region to safely and permanently store significant amounts of anthropogenic CO2. 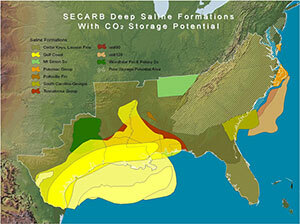 To identify at least one specific site that can accept at least 30 million tons of CO2 from future commercial CCS operations. 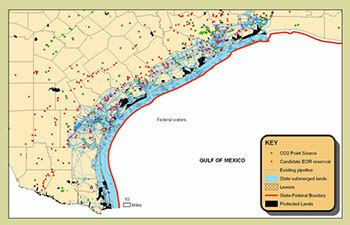 Texas offshore state-owned lands extend 10.3 miles offshore. The total area is about 6,400 square miles. Forty percent of the area is bays, estuaries, and passes, while sixty percent is seaward of the barrier islands. Less than twenty percent of the state-owned land is currently leased. 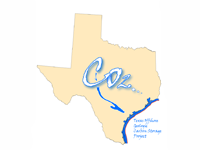 Initially, the project will focus on identification of specific Miocene–age reservoirs and sealing intervals on the middle and upper Texas coast, where capture and transportation are most likely to develop in the near-term. Specific geologic storage sites identified will have potential to store at least 30 million tons of CO2 and will be tailored to meet the full life-cycle emissions of associated CO2 sources. The surface and subsurface rights are owned by a single entity (i.e., State of Texas GLO) that is prepared to lease them for offshore storage. This investigation is co-directed by Dr. Tip Meckel and Mr. Ramon Trevino and is funded by the Department of Energy and the Texas General Land Office., which oversees leases and manages Texas' extensive offshore Submerged Lands. The study has received commitments of in-kind (data) support from ION Geophysical Corporation, Formosa Plastics Corporation and Formosa's subsidiary Neumin Production Company. Organizations collaborating on the proposed study include the University of Texas Institute for Geophysics, the University of Texas at Austin Department of Petroleum and Geosystems Engineering, Los Alamos National Laboratory and Sandia Technologies, Inc.